Although stepping out of our comfort zones and attempting something new or unfamiliar can be terrifying, it can also be exciting and liberating. The adrenaline will take over, but once you’re done, the feelings of fulfillment and confidence will start to kick in. This is why it’s so important to step out of your normal activities and try something you’ve never done before. Whenever I’m in a rut, I sit back and think about something new I can try. Over the past few years, I tried surfing, night swimming with manta rays, snorkeling in shark infested water, repelling, zip lining, skydiving, running a half marathon, trapeze, charter fishing, horseback riding, flyfishing, and the list goes on! I love facing my fears and jumping into the unknown. The key is not to focus on perfection or failure but to dive in and learn as you go. Even if you’re bad at something, it doesn’t mean it won’t be fun. Last week, I accepted a challenge from Backcountry to get outside and try something new. I packed my bags and flew all the way to Colorado to meet up with my brother for a fun day of skiing. 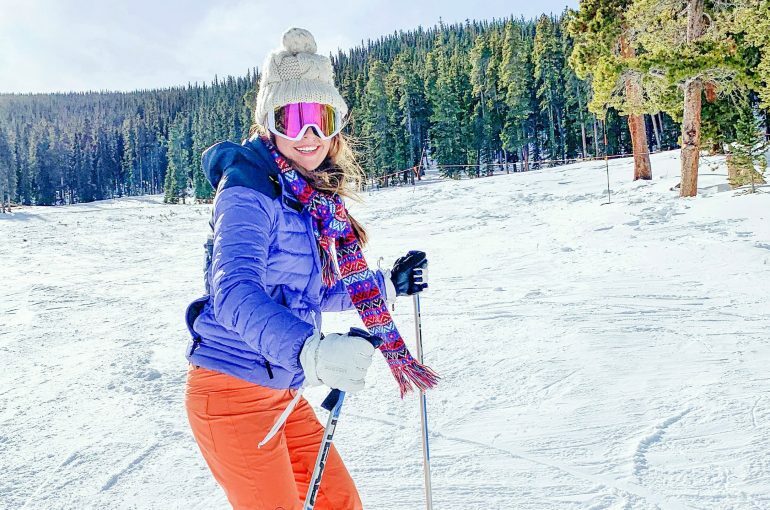 I was happy to make it out alive and quickly learned that skiing is not my forte, but my brother has found a new love for skiing and has already planned out his next trip. If you don’t put yourself out there and try new things, you’ll miss out on the possibility of finding something that brings so much joy and purpose to your life. I live in the south, so ski gear isn’t something I own. I was able to find everything I needed on Backcountry, and it was shipped within two days, which was perfect because I had time to try it all on before flying out. If you need something last minute, Backcountry offers free 2-day shipping on ALL orders over $50 across the country! I visited three outdoor stores to get my sizes before ordering, but it turns out they don’t sell any snow gear in the south. Backcountry is the ultimate one-stop spot to shop because I was able to order gear and apparel in one order instead of running around all over the place. One thing that I love about purchasing apparel on Backcountry is that people are active on leaving reviews. Before ordering an item, I can go through the comments and see if I should size up or size down. Backcountry carries the best outdoor brands and products that are both technical and stylish. I’ve discovered so many new brands that I love by shopping with them. If you do find something you love on Backcountry, you’ll have the opportunity to contribute at checkout to Backcountry and The Nature Conservancy to help support its mission of protecting the lands and waters on which all life depends. Backcountry has been a partner with The Nature Conservancy since 2008. If we want to continue our fun adventures on earth, it’s important to give back and contribute to it. The words “pizza” and “french fries” repetitively played through my head. Pizza your skis to slow down and french fry your skis to go. I may have been the slowest skier and took a few too many falls, but I had the time of my life! When you fall, you get right back up. My brother is in the Air Force and lives on the other side of the country, so we only get to see each other a few times a year, and being able to go on this adventure with him meant a lot to me. Enjoying new outdoor experiences with the ones that matter the most makes the fear of the unknown a little easier. Life goes by fast, so it’s important to build memories that’ll stick with you for the rest of your life. 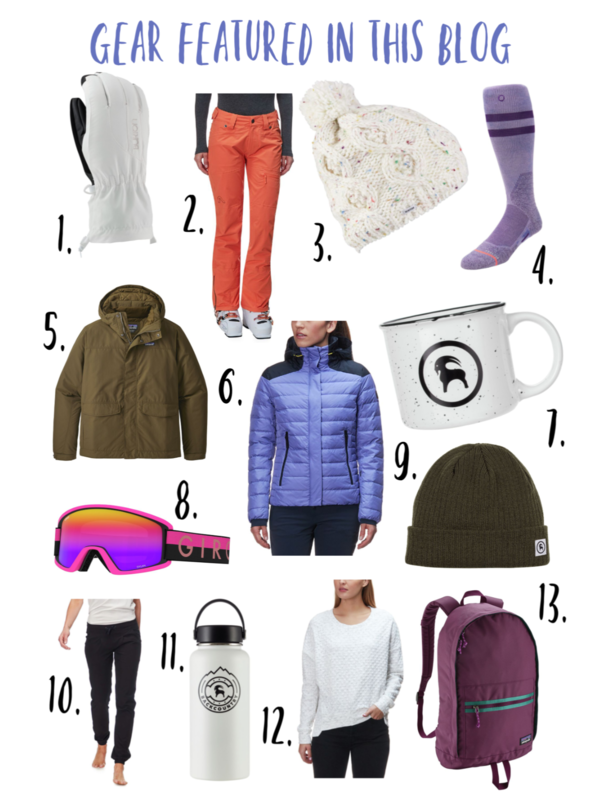 I had no idea where to start when it came to shopping for ski gear and apparel. Backcountry has hundreds of gearheads that are available 24/7 to help you out. Reach out to them if you don’t know what to pack on your next big adventure. All of Backcountry’s gearheads are experts in their fields, whether it’s mountain climbing, yoga, running, skiing, and so on! The gearheads have tons of knowledge about what gear you’ll need for your next adventure. They were so helpful when it came to picking out everything I needed to get started with skiing. I felt extremely confident after placing my order. 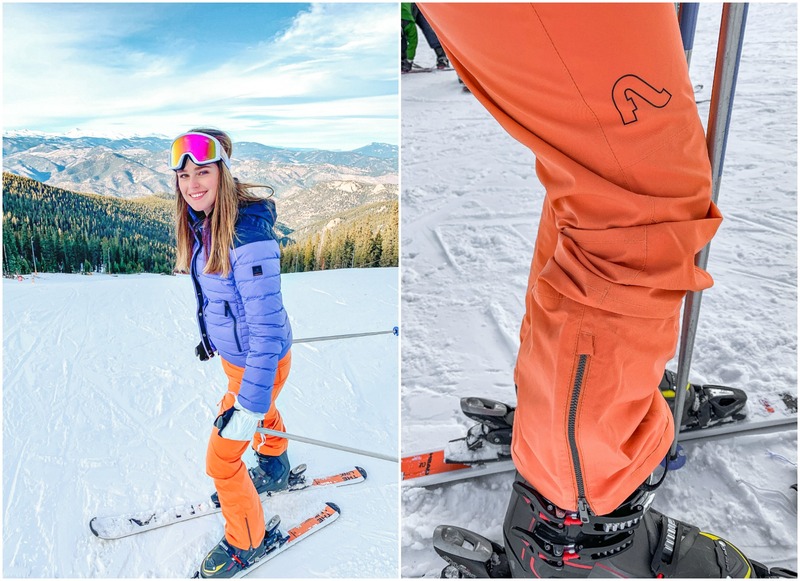 There were so many ski pants to choose from, but I went with the Flylow Sassyfrass pants in the papaya color. I loved that I could fit pants underneath and they’d keep me warm all day out on the slopes. I needed a sturdy pair of pants that could take some beating with my falls, and these were perfect. I had my Backcountry On The Go Pants on underneath, and I could still bend and move comfortably with stretch. I didn’t have any issues with keeping warm, and snow never made its way under the pants when I took a fall. I love the zipper on the ankles to make getting in and out of the pants with shoes easier. They fit perfectly over the ski boots without being baggy. 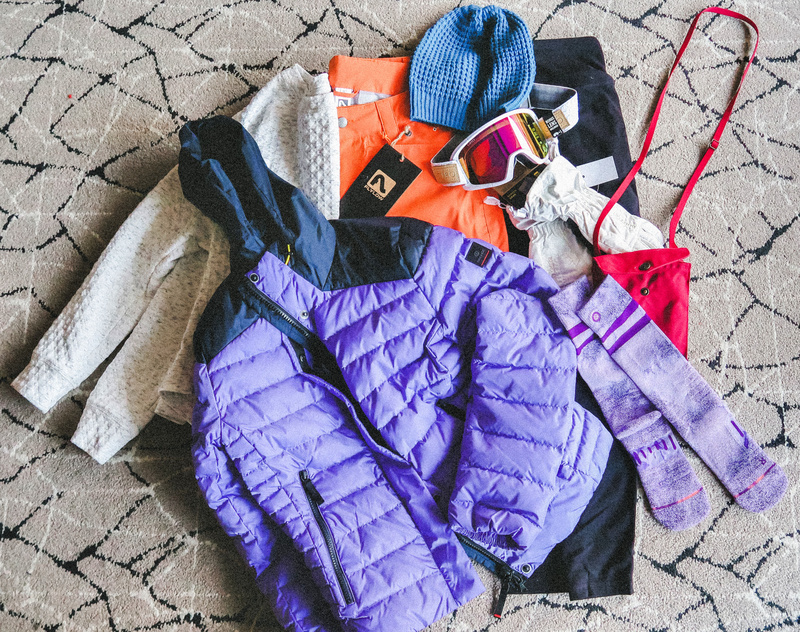 With so many coat options on Backcountry, it was hard to decide which coat to go with. 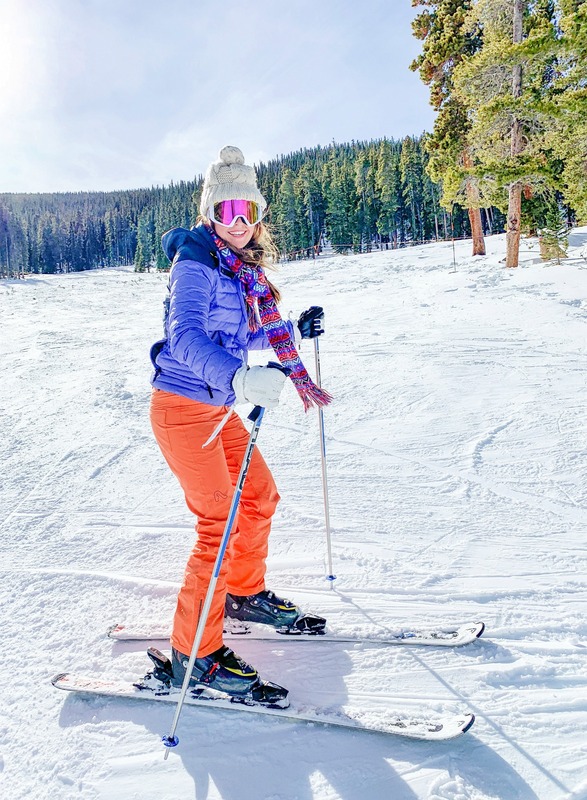 I came across the Bogner – Fire + Ice Abela Jacket and fell in love instantly. It was hard to decide between white and lilac, so I took a poll on Instagram, and you all chose the Lilac. When the coat came in the mail, I tried it on and didn’t want to take it off. It’s fluffy, warm, and the material is extremely high quality. 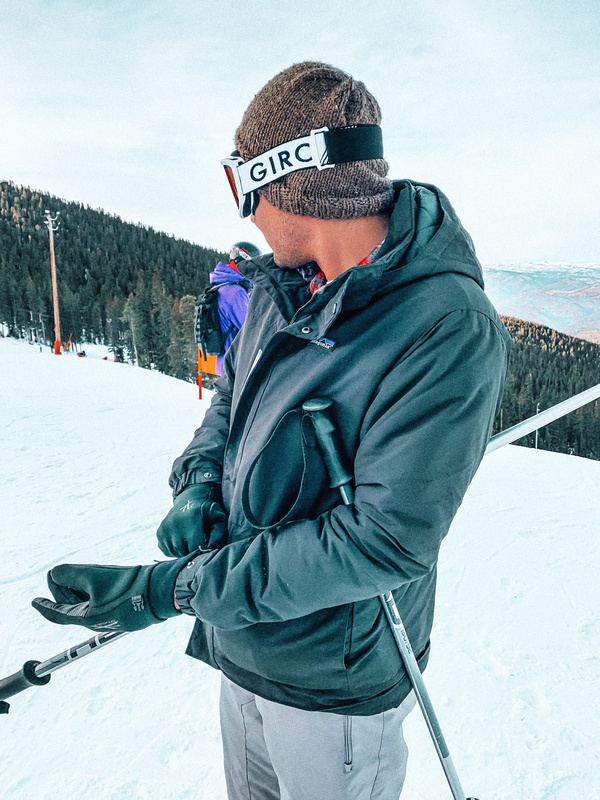 The coat is made with down insulation that traps body heat to keep you warm on the slopes all day long. The coat is water-resistant and fends off light snow, which is perfect for people who fall a lot and get covered in snow…This coat is the best investment for winter! I wore my favorite Stoic popcorn pullover underneath for extra warmth. We went out do dinner in Denver right after skiing, so it was the perfect transition to everyday wear. I wear this sweater on every flight, and at least twice a week. It’s 40% off right now, so you may want to take advantage of that steal. 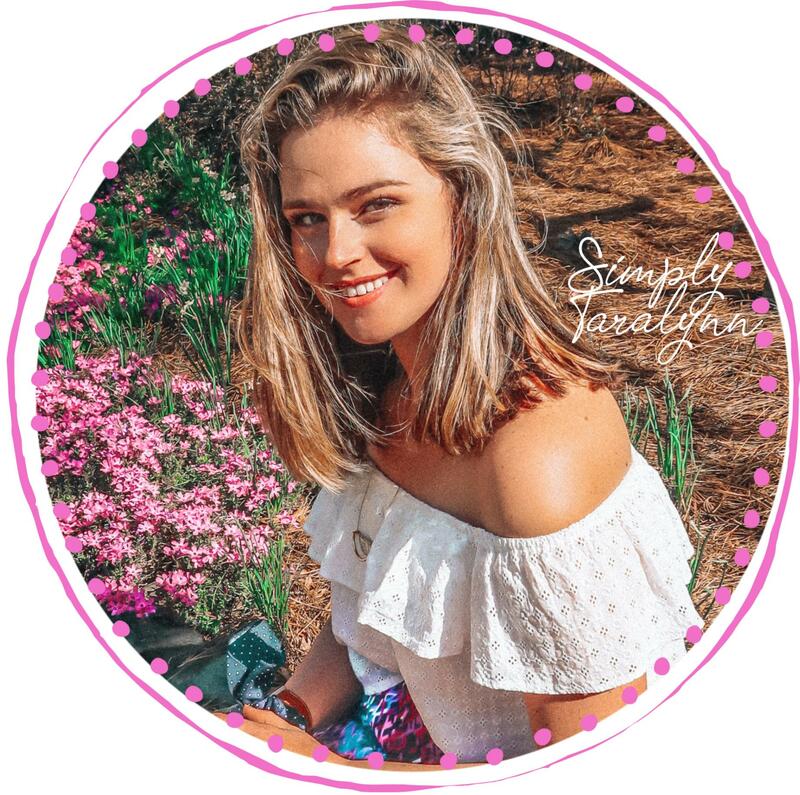 Plus, if you use code TARALYNN15 on your first Backcountry purchase, you’ll get 15% off the entire order! When you’re skiing, you don’t want to go out with your regular everyday-socks. You’ll want socks that are padded to keep you comfortable and warm. I went with the Stance Slideshow Park Sock. The sock is made with wool fabric to keep your warm and prevent moisture from coming in. These socks go over the calf, which helps with the unwanted sock bunching. My brother wore the Smartwool Socks, which I’m also a fan of. A few months back, I mentioned the Isthmus jacket I picked out for my boyfriend. He loved it so much that I ended up getting my brother one for Christmas because I knew he was going on a ski trip with his friends in Mammoth. He loved it just as much as Kyle did! The men’s Isthmus Jacket is made from sturdy wind and water resistant material. I think it’s pretty cool that the insulation is eco-friendly and made with recycled material. We both wore Giro goggles. They have an injection-molded cylindrical lens with expansion view technology. They also have an anti-fog coating which is super important if you want to see while skiing. I’d say that’s pretty important! The double-layer face foam with microfleece lining makes the goggles super comfortable, and you can adjust them to fit over your hat and helmet. When I was going down some of the larger slopes, I had them go around my helmet. There are so many colors to choose from! And if you’re ready to take your adventure to the next level, like my brother, Backcountry also sells the best gear! My brother is now looking for his own pair of skis and boots, which he’ll be purchasing from Backcountry! I will stick to renting until I can “french fry” without falling. Keeping my hands warm is my number one priority when it comes to being out in nature when it’s cold. 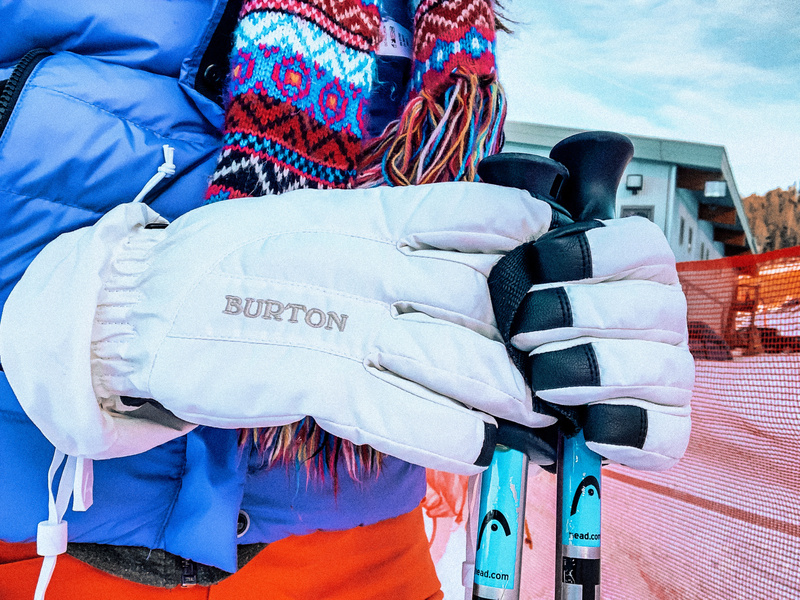 I did a lot of review reading and decided to go with the Burton Profile Gauntlet Glove. I was worried about purchasing gloves that would be too stiff, but the flexibility in these gloves are perfect for activities. Not one ounce of cold air made it’s way through. The gloves have a drawstring around the wrist to tighten and keep the cold air out. 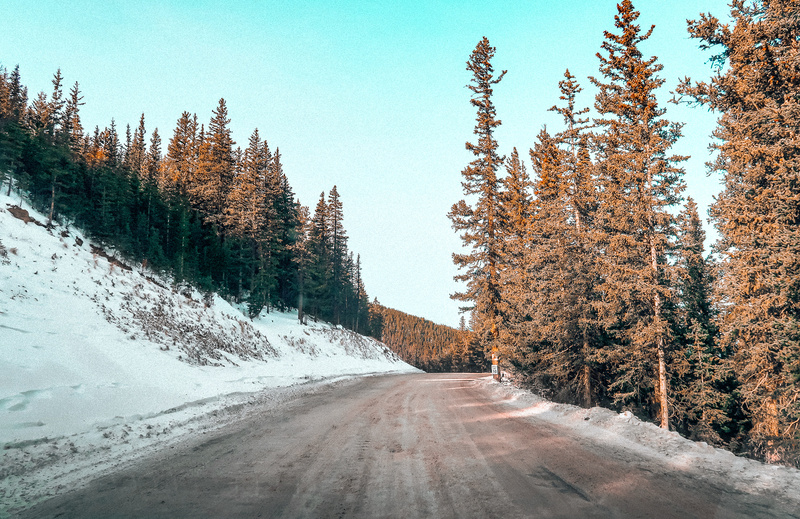 Make sure to bring a Hydroflask before you head out to a ski resort. I found myself so thirsty after each run! The lounge area had free water stations, so it was perfect for quick refills. This ski trip was definitely GOAT worthy! When I asked what my next adventure should be, a lot of you guys said skiing, and I’m so happy I finally had the chance to experience it! I hope you all feel inspired to get outside and create a new goat worthy adventure! 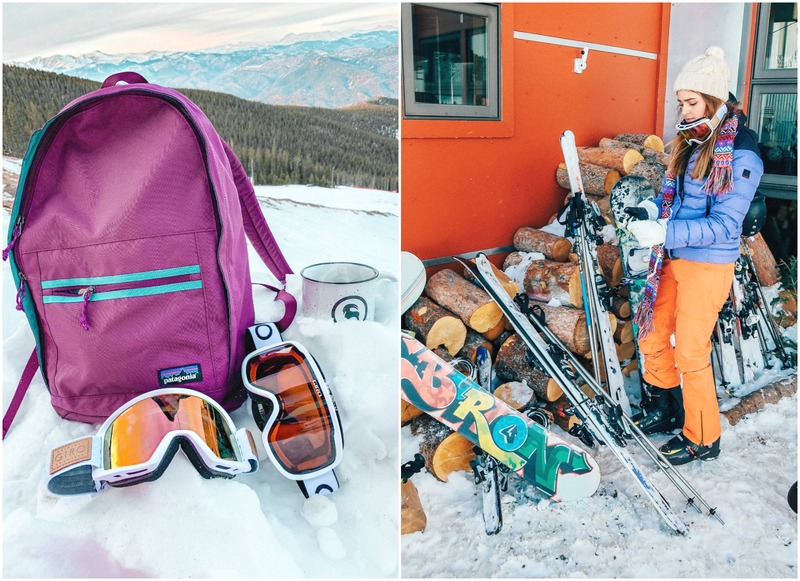 Don’t forget to use code TARALYNN15 for 15% off your entire first purchase on Backcountry.com! 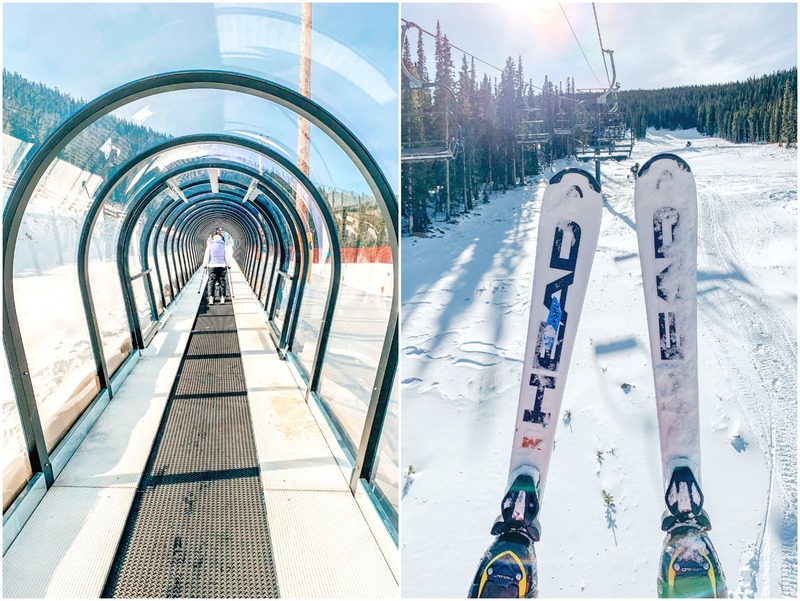 Have you ever gone skiing before? What is something new that you’d like to try? Visit Backcountry.com and tell me which product you love! Love the colors you chose for your gear! We LOVE skiing and go as much as possible (we’re actually hitting up our local mountain tonight for night skiing!). We live in the Northeast though, so there’s always good skiing to be had. I am jealous of all that great gear you got. Skiing is NOT a cheap sport. I’d love to ski in Colorado sometime. So glad you enjoyed it. It’s a sport to love! I bet that is so much fun! The slopes look really cool lit up at night. What a great trip! Looks like you had a blast! I’ve always wanted to try skiing! Definitely try it out! I’m excited to go again here in the Carolinas! Do the snowpants have zippers? On the bottom of the pants? They sure do! We have been thinking about making a trip to Echo Mountain! My husband is a great skier. Me? Not so much. I will end up watching him from the top with coffee as you mentioned. 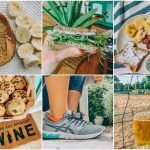 Will you be sharing your Denver restaurant guide? I’m going skiing for the first time in a few weeks! I am so scared! Ha, and I can’t decide if snowboarding would be better! omg, that’s exactly my reason! No one I tell understands me! Such pretty views!! I have been cross country skiing as a kid, that is definitely more my pace than downhill! I would like to try snow shoeing, it seems relaxing and would be a cool way to get outside in the snow! I love that pullover sweater from Backcountry! I think I’d like that too!! I just realized that you said you took off some of the gear for pictures. I was thinking my gosh she had to be so cold without a helmet and neck warmer! Did you feel like the tips of your fingers got cold in the gloves? I’ve been skiing my whole life and I can never find gloves that keep my fingers warm! Hand warmers help but they don’t reach your finger tips. I grew up in MI so we ski a lot! 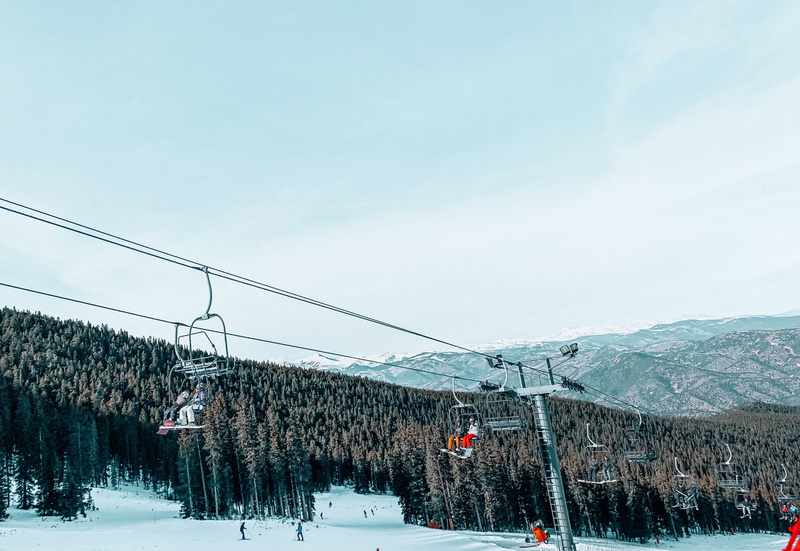 I’m actually heading back out to Mount Breck in Feb to ski and I’m excited! I’m such a baby when it comes to my hands getting cold and these gloves did not let any cold air in at all!!! And we were out there for hours! YESSSS. Love this! I am so happy you went and had such an awesome time!! I never tried skiing, but have gone snowboarding. It’s tons of fun. Also love all your gear, girl!!! I had so much fun! I hear snowboarding is tough!! Did you take a lesson? I’m learning to ski this season and I signed up for a 4-lesson package. 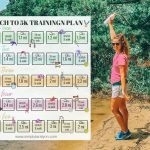 It wasn’t until lesson three that I felt any sort of confidence! Try it again for sure, but try a couple lessons, it’ll make a huge difference! Hi, Rachel! They had instructors on the beginner hill helping everyone out which was great! 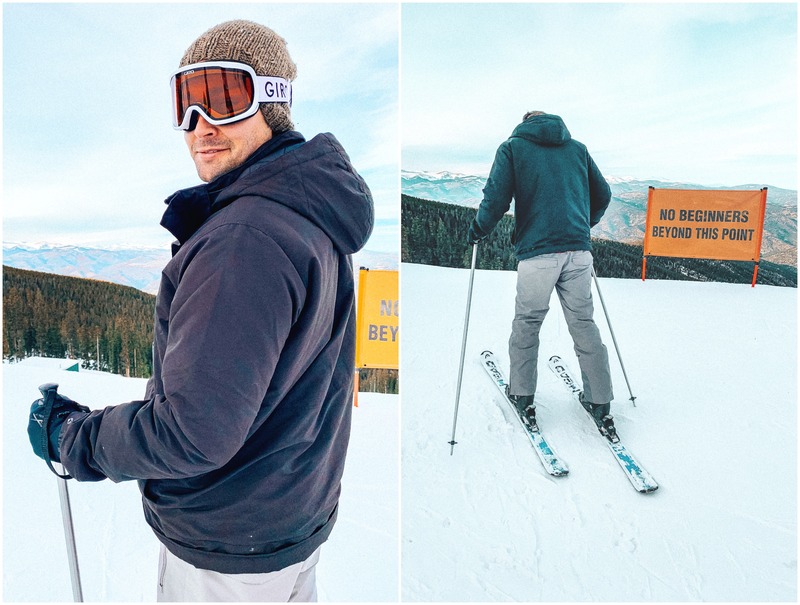 I got the hang of it, but most of the slopes were a little too advanced for me! lol I’ll for sure try it again. 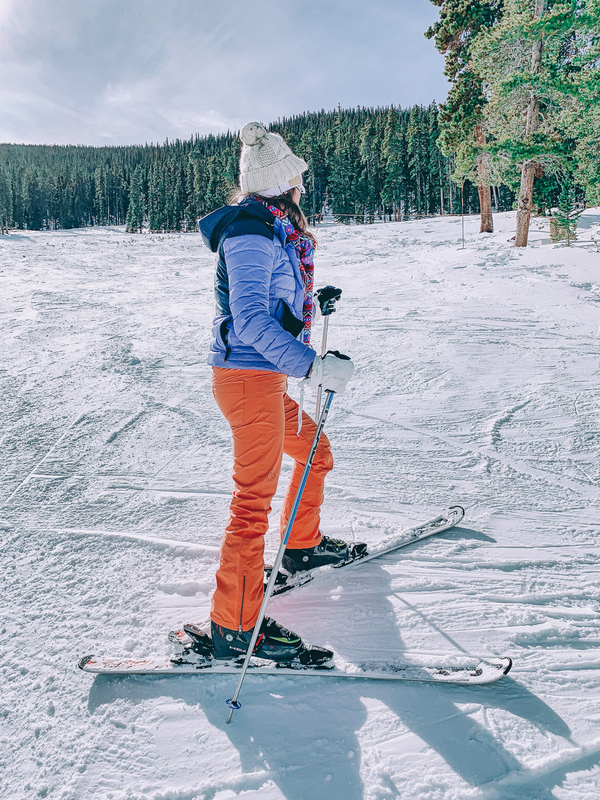 We have a few resorts in the Carolinas that have easier slopes for me to do! Welcome to Colorado! I am looking forward to your travel guide. How far is this resort from Denver? Thanks, Haley! It was so warm and comfortable! Being Canadian you would think I’ve been skiing but I actually have never been! It looks so hard, but I do want to go someday. I feel like you’d be so good at it!! I love skiing! I haven’t been since I was a teenager but I’ve moved to Vancouver Island and there’s a mountain just half an hour from me so I may give it a try again! At the end of February, I’m taking a girls weekend trip to Whistler, BC where I’m gonna try snowshoeing which I’ve been dying to try! I’m obsessed with the Patagonia pullovers, I’m hoping to get one at Patagonia in Whistler! It’s pretty fun! We are going to go in the Carolinas because the slopes are a little less intimidating lol You’ll have to let me know how your trip goes!!!! I live in Boulder but haven’t skid yet and it’s on my bucket list! I can’t wait to check out backcountry! I hear Boulder is gorgeous!!!! You are surrounded by ski resorts! totally go!!! Yes I actually went skiing in Copper Head Mountain in Colorado in 2008. I fell lots of times too! I also got stuck in the soft snow and so many people told me to kick my skiis off and then a few people came by and said to never kick your skiis off because you won’t be able to get out. Lets just say it took a long time to get out. I would like to try scuba diving one time! I love the Yeti coolers! I want one so bad! That’s so cool! Lol, my brother had me put the poles on one side and use my body strength to get up and to make sure my skis weren’t facing downhill! YOU ARE BRAVE!! I didn’t go any further than the green slopes lol and after that, I never went down it again!!! You are awesome!! haha omg! I’d be terrified! I rented my helmet with the skis and wore it going down all the hills except the training hill- which hardly a hill and had no trees, and the instructor said there was no need for the helmet. My pictures were taken without my helmet to show off the gear. We ski every weekend. It’s what you do when you live in Maine, lol. If you do give skiing another chance, please please please wear a helmet. It protects you from yourself but also from other people. I definitely skid with my helmet, which was rented. I took the helmet off to take photos because it was ugly and black and a lot of the photos were taken when I was done with skiing. Thank you for your concern, and I definitely agree with you.